— Harry Johnson, in Bartenders' Manual (from Mud Puddle Books' 2008 facsimile printing of 1900 edition of 1882 guide). One of the glorious aspects of the cocktail world is that it happens to be populated by folks from all walks of life, each bringing their own expertise — graphic designers, historians, engineers, collectors. Take Darcy O’Neill, for instance. He brings a chemist’s point of view, and I’m always fascinated by what he shows up with at the bar, metaphorically speaking. His seminar on the science of taste at Tales of the Cocktail ‘08 remains one of the more intriguing I’ve ever attended. He also manages to find and explore niches that few others have bothered with (for instance, drinks of the 1600s at TOC ‘09). Now he’s turned his attention to a whole class of lost beverage that hasn’t had much love from the cocktail geeks: phosphates and sodas. These weren’t alcoholic drinks, but they often found a way to mate with spirits — especially during and after Prohibition. He recently collected his research in an e-book called “Fix the Pumps” — a phrase drawn from soda jerk lingo and translated as, well… you gotta go buy the book. Phosphoric acid was considered a general tonic, aphrodisiac and stimulant of the nervous and cardiovascular system. Pharmacists regularly provided it as an over-the-counter pick-me-up or bracer. It was most commonly prescribed as acid phosphate—a mixture of phosphate mineral salts and phosphoric acid. The acid phosphate was served by diluting it with water and adding sugar to improve palatability. It wasn’t long before people acquired a predilection for this acid mixture and it quickly found its way into sodas. The belief that phosphoric acid, and the phosphate salts, helped all manner of ailments only encouraged its adoption. He also writes about long-lost fountain drinks, like the Lactart (made with lactic acid derived from milk), Elixir of Calisaya (a relative of tonic water). and Aromatic Spirit of Ammonia, which would be used, a few drops at a time, in a fountain drink like Coca-Cola. Darcy assures us this is nowhere near as terrifying (or nasty) and it sounds. The e-book also contains a slew of recipes for “fancy syrups” (elderberry mead, kola celery tonic), punch syrups (malaga milk punch, Tivoli punch), and a whole lot of intriguing sounding sodas, like almond sponge, lime slip, and maple frostbite. I’m looking forward to trying these out, then experimenting as to which spirits go well with each drink. I'm putting on my laboratory coat as I type. “Fix the Pumps” is available as an e-book (PDF format) for $8.99. If there’s enough interest, Darcy says he’ll consider publishing it as a paper book. Here's hoping there is — it would be a welcome addition to my shelves. "Jägermeister, the brand known for consumer level innovative marketing programs and promotions, will once again be recognized as the official and exclusive spirit sponsor world’s premiere stadium off-road motorcycle circuit: the 2010 Monster Energy® AMA Supercross, an FIM World Championship. Jägermeister is the first distilled spirit to sponsor AMA Supercross.﻿"
Is the national cocktail revival running out of steam? Not that I’ve seen, and certainly not in San Francisco. Three eagerly awaited cocktail bars are opening soon, including one officially opening tonight. That’s the report, anyway, from H. Joseph Erhmann, who gave an erudite state-of-the-cocktail report last night at the Museum of the American Cocktail in New Orleans. A bar owner so famous he goes by just one letter, H is the owner of Elixir in San Francisco, one of the pioneering bars leading the way toward green, organic, and quality ingredients in cocktails. Smuggler’s Cove, which officially opens its doors tonight amid considerable hoopla (it’s already gotten favorable notice in a splashy piece in the New York Times), is a shrine to all-things-rum founded by Martin Cate, lately of the much-revered Forbidden Island in Alameda. It’s located at 560 Gough St. (at McAllister). The Comstock Saloon is slated to open in January at 155 Columbus Ave. The folks behind this renovated historic bar are Jeff Hollinger and Jonny Raglin, formerly of another celebrated San Francisco bar, Absinthe. Look for lots of classic cocktails made with fresh ingredients and housemade syrups. Bar Agricole — a restaurant and bar — will open sometime in February at 355 11th St. Thad Vogler of Slanted Door and Heaven’s Dog is the man behind this, and he’ll expand out his fresh-market approach to cocktails and their ingredients; plans call for a indoor garden, and the use of specialty small-batch spirits from local distilleries. H also riffed on the disparate San Francisco and New York cocktail styles, which he said were until recently far more distinctive, with New York noted for its spirit-heavy vintage drinks, and San Francisco for its market-fresh drinks that employed the abundant, excellent local citrus and herbs, along with vegetables and other fruits. He says those distinctions have been blurring since Bourbon and Branch opened in 2006, bringing a more “spirits-forward” approach to west coast cocktails. My takeaway: a trip to San Francisco is long overdue. Brad Thomas Parsons' BITTERS, the history and mystery of how this concentrated alcoholic infusion of aromatic plant roots, bark, herbs, spices, and fruit was first used as a tonic to remedy ills, but has since gone on to be an essential element in quality cocktails, along with more than 100 recipes for homemade bitters and classic and contemporary cocktails using them, to Aaron Wehner at Ten Speed Press, for publication in Fall 2011. I've never met Brad, but I gather he's an editor at Amazon in Seattle, which is a good place to get well acquainted with cocktails, and I know Ten Speed Press puts out some beautiful books. Bitters has a rich and colorful history — any story that brings together Simón Bolivar, early cocktail history, gastrointestinal distress, and Trinidad offers a potential home run — and I hope Parsons hits it. I just wish we didn't have to wait two years to find out. Both approaches are useful, yet both approaches come up short. Comparing gins sipped neat always feels like an academic exercise to me since I rarely drink gin neat. And if I'm trying new cocktails made with gin, I tend to wonder, would this actually be significantly better using Aviation rather than Gordon's? Paul Pacult apparently wondered, too. He, along with Wine Enthusiast's David Talbot, and Spirit Journal managing editor Sue Woodley are launching a series of three events under the umbrella of the “Ultimate Beverage Challenge.” These will be staged at the Astor Center in New York City next year, in March, April, and June. The first will be a spirits competition, and the last a wine competition. Both are tweaked to refine and improve existing judging methods, but neither are radically different from competitions taking place elsewhere. Pacult's being aided in this by, among others, Dale DeGroff and David Wondrich. J.J. Goodman is a talented and gregarious young bartender with terrifyingly large reserves of energy and the retro-groovy flair of a reincarnated Austin Powers. Goodman and some partners opened up the London Cocktail Club not long ago as a place to showcase their mixological talents. They didn’t have much money, so they took a sort of hermit-crab approach: they found space and they moved in. In this case, the available space was the lobby of the Art Theater, a low-key peformance space in a basement near the heart of London’s theater district. It’s scarcely marked — they call it a “Victorian speakeasy,” a concept that makes my brain stutter — but you can find it with just a street address, a little Googling, and by paying attention walking down the block. They serve drinks before shows and during intermissions — theatre patrons “don’t drink as much as I’d hoped,” Goodman told me — but the bar is also open when the theater is not. The space is low-ceilinged, compact and casual, with some leather chesterfields and a four-seat bar. It has the feel of a gentleman’s club as envisioned and created by underfunded university students — and I mean that in a good way. The crowds tend toward the young and hipsterish. The cocktail list is fun to peruse, and offers a respectful detour through the old familiars (Vesper, old-fashioned with orange bitters) before setting off into new terrain, where the owners strut their stuff. Alas, I never got past the detour. The unexplored territories alarmed me more than a little (Cachaca and cream? A “martini” with vodka, pineapple juice, and Chambord? ), and I opted to remain on familiar ground, which I found comforting and pleasing. If you get to the new territories send me a postcard — I’ve been more curious in retrospect than I was when actually there. Also a little alarming: Flair. A couple of the barmen when I visited gave in to occasional outbreaks of flying bottles and shakers, which I find never enhances my drinking mood. Bottom line: Stop by for a drink to support the next wave of bartender, but no need to linger long. London Cocktail Club, 6-7 Great Newport Street, Covent Garden, London. "'This is a good place,' he said. "'There's a lot of liquor,' I agreed." Jake Barnes, upon arriving at a bar in the first chapter of The Sun Also Rises, by Ernest Hemingway. The making and drinking of great cocktails has become cultish in the past few years. Where to go, what to drink, what not to drink. (hint: rhymes with wodka) — so much to know! I don't think this is necessarily a bad thing — those who first saw the Beatles in a basement bar in Liverpool probably felt cultish — but I hope it's not where the cocktail revival ends up. I'm hoping it eventually comes squinting out of the speakeasy basements and finds its way into the mainstream. The ultimate goal, as I've said before, is one day to be able to walk into any airport bar and get a well-made old-fashioned. That won't happen if the making of great drinks remains a cult endeavor. I'm always looking for evidence that good drinks are moving into the light of day Most often, I'm disappointed. It seems that more and more aboveground bars are now hitching their trains to the cocktail revival and are claiming to be serving classics, but then deliver luridly colored drinks that somehow manage to be too sweet, too sour and too artificial tasting, and all at once. This does not advance the cause. But here's some good news: I did find an example of a mass-market bar heading in the right direction the other day. Granted, it's not TGIFridays or Margaritaville. It's the restaurant in the brand new wing of the huge National World War II Museum in New Orleans. It's called The American Sector., and is a big, brightly lit affair designed for volume. 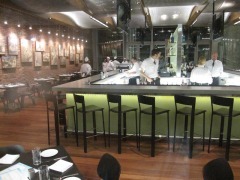 It's also one of a half-dozen restaurants in town overseen by celebrity chef John Besh. The food's quite good, not surprisingly. But I was also impressed by the drinks. To start with, there's a nice, large list, which includes $7 cocktails like the Blood & Sand, Sherry Flip, Herbsaint Frappe, and Pimm's Cup. For another dollar, you can get a Sazerac, Ramos Gin Fizz, or Mint Julep. But Besh's people also did some digging in local archives, and came up with drinks from a 1940s cocktail menu at the Blue Room at the old Roosevelt Hotel (which has recently reopened in a nicely refurbished state). These are priced at $9.50 and include the Aviation, Big Mamou, and Creole Cocktail. I went with the Creole— a mix of Southern Comfort, lime juice, Benedictine, and sweet vermouth. Anything with Southern Comfort sends up alarms; it's really easy to make a treacly mess of it. But this was nicely balanced, full and complex, and tasted just like a classic should. On future trips, I'm aiming to work my way through the list, starting with the Sazerac, which, of course, is the baseline cocktail for judging any bar in New Orleans. And this was a nice touch -- for $6, you can order a "Sector Soda," which comes in a quart siphon bottle filled with a house-made flavor like lemon-grape, cherry, or nectar. (On nectar: it's a New Orleans thing. If you have to ask, you won't understand.) I had root beer, which was way more interesting and complex than most anything I've had out of a can. Bottom line: worth checking out. The American Sector, National World War II Museum, 945 Magazine St., New Orleans, LA, open daily 11 to 11. Restaurant & bar is open to the public; no museum admission needed. — Pegu Club's Audrey Saunders, in a New York Times article about her new bar (The Tar Pit, opening in December in Los Angeles). "Created in San Francisco, the birthplace of the original martini, Devotion Spirits is set to unleash the groundbreaking power of the first-ever 80-proof, four column distilled vodka with the benefits of protein that is made in the United States. Whether enjoyed on the rocks, mixed, stirred or shaken, Devotion Vodka provides for the smooth, delicious ultra-premium vodka taste discerning mixologists (professional or novice) are seeking. "The patent pending proprietary solution found only in Devotion Vodka will transform the cocktail. While bar shelves are cluttered with vodkas from around the globe in every imaginable flavor, Devotion is the first and only vodka which literally provides a drink with a real protein boost. This revolutionary spirit will create a new beverage category, while also defining a new generation of vodka aficionados who devote themselves fully to everything they do in life." One of the items that made it into my suitcase back from Rumfest UK were a couple small bottles of Roots Wine. The maker of it had a stand at Rumfest, and was offering it up straight and mixed with rum. A nice little crowd gathered for much of the day, in part because he had a thatched hut (and nothing draws people at a rum event like a thatched hut) and in part because nobody could figure out what exactly this product was. I had a couple of swigs in London, and it was... interesting. Funky. A nice palate cleanser after sipping a couple dozen rums that day. I thought someone — someone more creative then I — might concoct an interesting cocktail with it. I bicycled up to Cure the other night to see what the mandarins there might do with it. I opened it, which was followed by a lot of sniffing and straw tasting, then a lot of brow furrowing. Kirk Estopinal mustered the brass to try something with gin. And it was... interesting. Funky. Sips all around, more furrowed brows, etc. Then someone at the bar figured something out — "It smells like sauerkraut," he said. And, lo, it did. (That's the funk!) He set the bottle down, and everyone moved away from it. The little bottle sat alone for the rest of the night. I still like the concept of this stuff — it's sort of like a small-batch fermented bitters (although, admittedly, without much of a bitter component). It's just that the cabbageness gets in the way. Still curious? It's available around England but can be shipped to the United States. See Roots Wine for more info. If you figure something out, let me know. Trailer Happiness has occupied an uncommonly large role in my imagination since I first heard about it a few years ago. I imagined it as a sort of crowded, campy kind of tiki bar with lots of elaborate tiki drinks overseen by Polynesian statues and cluttered with kitschy art. I was thinking, "thatch." And, of course, "rum." Well, I finally got around to visiting last month… and it turned out to be not at all as I imagined. It had a much leaner, cleaner looker to it — more like a ca. 1972 rumpus room from the American suburbs, with paneled walls and a big sectional couch. (It is, in fact, located in a basement.) I would have known this had I taken the minute or so to visit their website — it claims “the e-z-boy feel of a low rent, mid-60s California valley bachelor pad,” which is pretty much spot on. The staff takes great care in the making of drinks, and they’re worth waiting for. I particularly liked the Sly Mule — a mix of Appleton, honey cream, elderflower liqueur, fresh lime juice and ginger beer. My favorite of the night, though, was a ginger and lychee caipirissima, with Appleton, Velvet Falernum, lime, ginger juice, sugar, and lychees. In my opinion cocktails tend to be either refreshing or complicated. This one somehow managed to be both. Bottom line: worth resheduling travel plans and making a lengthy detour. Trailer Happiness, 177 Portobello Rd., Notting Hill, London. Phone: 020 7727 2700. Tube route: take Circle line to Notting Hill Gate; head to Portobello Rd (ask a passerby) then walk about 10-15 minutes until you arrive. It's at a corner, down steps to a basement. 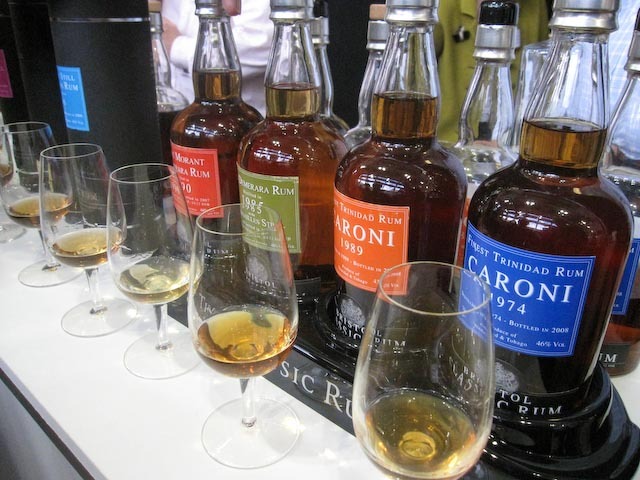 At Rumfest UK last month — an exceptional two-day affair in London with lots of tastings and talks — I came to the sad realization that we Americans must content ourselves with a rather narrow range of West Indian rums. Represented at the Fest were two “classic rum” outfits which scout out aging casks of rums in the Caribbean and sell them in special bottlings in England (and sometimes Canada). I was especially taken with the Plantation Extra Old from Barbados, a new bottling (about $100 a pop) with big banana notes and a lush butterscotch finish. Also nice was the Rockley Still Barbados rum, a pot still rum finished in Madiera casks that reminded me of some of the heavier Demerara rums, although with a much drier finish. A couple of other Barbados rums caught my attention: Mt. Gilboa, a pot stlll rum produced in St. Lucy, on the island’s northern tip, by the same folks who make rum for Mount Gay. The rum labeled as Mount Gay label includes a bit of pot still rum to add flavor to the column still product; Mount Gilboa is wholly from the pot still, and was a big, full, delicious rum that filled the mouth. Also new: St. Nicholas Abbey Rum, made on the grounds of one of the most architecturally spectacular sugar estates anywhere — the main house dates to about 1658, and sits amid 400 acres of sugar cane (I’ve written about it — pre-distillery — in the New York Times and The Atlantic Monthly.) The rum they were offering up for sample in London wasn’t actually from the estate — St. Nicholas has been producing sugar cane rum from pot stills for about a year, but their output is still aging in barrels, and until it's ready they’re selling a robust, flavorful rum from the sprawling Foursquare Distillery. I'm looking forward to sampling their own rum when it's ready. Among the many conclusions I arrived at during my too-brief time at Rumfest UK: I must return to Barbados, and soon. And: I must resturn to London for Rumfest next year. But, no... it's named after a fishing fly. You know, of the sort used in fly fishing, a wholesome outdoor activity. Oregon, and all that. The company started up last spring, and has a small still Brookings, Ore., on the coast just north of the California state line. Superfly starting shipping its first product, a potato vodka, in mid-September. It's being distributed only in Oregon to date. Next on the line: a spiced rum, a whiskey and a gin. I haven't tried any Superfly yet, but I'm looking forward to correcting this. For more info, visit Superfly Distilling. Firpo's Balloon Cocktail. No, thanks! My column in the November issue of The Atlantic is about Charles H. Baker Jr., author of A Gentleman's Companion; Being an Exotic Drinking Book or, Around the World With Jigger, Beaker, and Flask, who is famous in certain circles for the spectacular impotability of many of his drinks. For the story, I spent an afternoon with St. John Frizell, who with his wife traced Baker’s travel through parts of South America and Asia, looking for the places where Baker drank. (The Atlantic story is online here.) The story concluded that bad drinks serve a purpose — in short, they make you appreciate the good drinks. The recipe calls for equal parts rye, absinthe, sweet vermouth and two dashes of orange bitters, then shaken well with a bit of egg white. I like rye, absinthe, and vermouth. How bad could that be? Curious, I mixed up one last night using R1 rye, Ted Breaux’s Nouvelle Orleans absinthe, Boissiere vermouth, and Angostura orange bitters. And…. it was, as Frizell promised, nasty. The color was a sort of institutional grey. The taste? All muddled and confused. The thought process of former president George Bush was once described as “call-waiting thinking,” with one thought constantly interrupted by another incoming one. 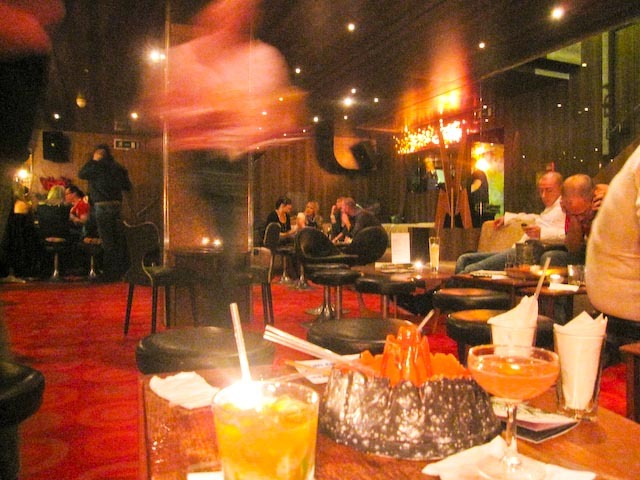 Firpo’s Balloon Cocktail is a call-waiting cocktail, with one taste constantly interrupted by another. I did like getting the brief call from the absinthe. But I did not like wasting that fine absinthe by pouring everything down the drain after a couple of sips. “This is another one to watch cannily lest our pedal extremities fold up at some totally inappropriate moment,” Baker wrote. He was wrong on this — he assumed his reader might drink one or more of these, which they won’t. Never mind five. But I’ll give it this — it made my next cocktail, a Scofflaw, taste all the better. Baker's book is available here. St. John Frizell's bar, Fort Defiance, opened last summer in the Red Hook neighborhood of Brooklyn. Frizell wrote a great story on Baker and his quest last year in the Oxford American. Five years ago, shortly after getting the first farmer-distiller’s license in Massachusetts, Rich Pelletier told his wife he was planning to tie up about $100,000 worth of inventory by putting up single malt distillate in barrels to age. If everything worked out, he figured, they just might be able to make some money someday. But things go wrong, as Pelletier learned this month as he was just getting ready to bottle his Nashoba Single Malt — one of the few American single malts produced. Not fatally wrong, but wrong. A little background: apple wine has been made at this sprawling orchard thirty miles west of Boston since 1983. When Pelletier bought the 90-acre farm in the early 1990s, he continued with the wine, but wanted to see what else he could do. In particular, he figured he should be able to do something with all the apples that fell to the ground to rot — like, maybe, ferment them and make vodka. So he successfully pushed the state legislature to create a farm-distillery license, and began producing a popular apple-based vodka. Back to the whiskey. In 2004 Pelletier started with two barrels of single malt (made from Canadian barley), aging it in old peach and wine barrels. He dipped the thief in now and again. And earlier this year he decided it was time to bottle the barrels. Pelletier planned to bottle some 600 bottles from his freshmen effort — some 280 had already been presold when I was there. (A bottle cost $49 before September 1, and $59 after.) He put five barrels up the second year and has been expanding gradually since. He’s planning to hold back some future barrels, and eventually sell 10-year and some older expressions. The bottles he’s using are from Italy and are quite attractive — heavy glass polygons, like rectangles that knocked slightly askew in a bar fight. And I thought this was a nice touch: he’s sawn up the barrels in which the whiskey aged, and attached a two-inch block of stave on each cork, so you get a souvenir of whence the whiskey came. So what went wrong? Well, when the bottles were delivered last month, they stunk. I mean, really stunk, of something foul and toxic — he had to move the pallets outside the building. They were not, in short, not something into which you wanted to decant a delicate, five-year-old whiskey. The expense of cleaning and testing the bottles was deemed prohibitive. So Pelletier ordered a whole new batch of bottles from Italy. The initial early fall bottling has been pushed back again, now into late fall. Expect a November 2009 release of the Nashoba Five-Year Single Malt. I can hear you. You're saying, "Oh, good. Another cocktail blog." You are saying this without enthusiasm. I can hear that also. I am not going to defend myself here, except to say my only plan is to win you over with reporting that's worth your time. Small distilleries where the owner turns the valve that starts the still. Large distilleries, on occasion, where the owner has hired a staff that cares about making outstanding products. Bars that understand great cocktails require hiring people with a skill set that extends beyond tap-pulling. Bartenders who pay attention, and, uncannily, know what they should be paying attention to. Cocktails that make me stand up and shout, sometimes in tongues. Great drink-making gear (some traditional, some not) and where to get it. Outstanding mixers and other fine products that enhance or complement rather than obscure the taste of spirits. Cocktail history, especially if I find it a little amusing. Cocktail making skills and techniques. Cocktail drinking skills and techniques. Commodity cocktails; stupid cocktails; spirits made with flavorings also found in Jolly Rancher candies; cocktails served in 32-ounce glasses. I hope to encourage the difusion of great spirits and well-crafted cocktails by recognizing those who understand them. I'll admit this is chiefly for selfish reasons: one day I’d like to be visit any city or large town and know that there’s at least one place where I can order an old-fashioned and not have to first ask if the proprietor owns a bottle of bitters.